"Damnation! So that's how a man should be! He need only be handsome on the outside!" Welcome to my tribute to Notre-Dame de Paris! I've updated a little, but haven't found much lately. I wanted to give the page a bit of a new look. NOTE: If you haven't read the book or seen any of the movies, consider this page a SPOILER! It has been many years since I first read Victor Hugo's classic The Hunchback of Notre-Dame. I'd seen the 1956 film (though, not in 1956) and was so impressed with the story, I went to read the book. It has been my favorite classic ever since. I have gone years without thinking of it much, but recent events have rekindled my appreciation, and I want to share it with others. The translation I have is by Walter J. Cobb and was published in 1965, but I probably didn't read it until the early '70's. Recently, I went into a book store and, just for grins, went to see if they had a copy. What I found was the same translation and a new one published by Tor but with no name given to the translator. This was very contemporary in style, aimed perhaps at today's less well-read, public. I immediately felt that it did not have the literary mastery that Cobb's had, which I was used to and which might appear a little stilted by comparison. The turns of phrase were more modern and less evocative. I didn't read very much of it. There was also Bantam edition so poorly put together, the publisher should be ashamed to have its name on it. Granted these are mass market paperbacks, but they could at least get the type straight on the page! And have it be a consistent weight. It looked like the ink had been too heavy in some pages. (Obviously the millionth-generation print.) I think I'll stick with my NAL Signet Classic. Oh, and in case there is any doubt, I'm only talking about the unabridged version. I wouldn't dream of reading an abridged version of a book. Here is an overivew of the main characters in the book. Here are a few stills I've found from a couple of versions. 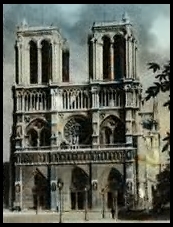 I don't have many of these related to Notre-Dame de Paris, but I have my other pages. Wikipedia's page on the French musical of Notre Dame De Paris, which has played in France, Quebec, London, U.S., etc. There used to be a site for this, but this is all I could find. You can evidently get the soundtrack and DVD of this one, and I hear it's wonderful, though I haven't done it myself yet. Inspector Javert Appreciation Page - My Les Misérables page with photos, fan fiction and more. Willie Loomis Tribute Page - My page dedicated to the great Dark Shadows character Willie Loomis, with photos, fan fiction and more. Thank you for visiting! Please feel free to send feedback to me. This page © Copyrighted to Mary Elizabeth Overstreet. It was launched January 2, 1999 and updated December 24, 2009.